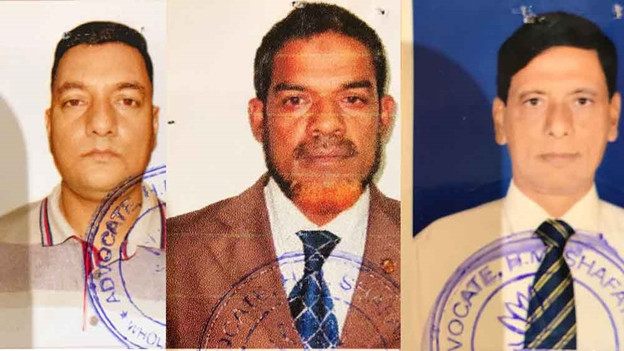 Prime Minister Sheikh Hasina’s security adviser accused of using state security to abduct three men in a business dispute. The most senior security and defence figure in Bangladesh has been accused of using military intelligence agents to abduct and interrogate people to settle a business dispute involving his wife. The allegations have been made against Major General Tarique Ahmed Siddique, Prime Minister Sheikh Hasina’s security adviser who has effective control over the country’s armed forces and intelligence agencies. General Siddique is considered one of the most influential members of Sheikh Hasina’s Awami League government and a very close personal ally; his brother is married to the Prime Minister’s sister, Sheikh Rehana. His niece is the UK Labour member of parliament, Tulip Siddique. The claims against General Siddique are being made by a former army officer and one-time business associate, Colonel Shahid Uddin Khan who is currently living in self-exile in the United Kingdom. Khan claims that three employees of his business in the capital city Dhaka were abducted by what appeared to be state security officers in January. The families of the missing men have all confirmed to Al Jazeera that they have not been seen or heard from since they were first taken, over twelve weeks ago. Al Jazeera has also obtained documents that appear to confirm Khan’s allegations. Khan alleges that nine months earlier, the same three men – along with another employee – were picked up from his Dhaka offices and secretly held at the military intelligence agency, the Directorate General of Forces Intelligence (DGFI). That incident happened one day after Khan wound up a company jointly owned by the security chief’s wife, Shaheen Siddique, who was its chairperson. The firm, Prochhya Ltd, had been trading since 2009 and was involved in several profitable land deals. 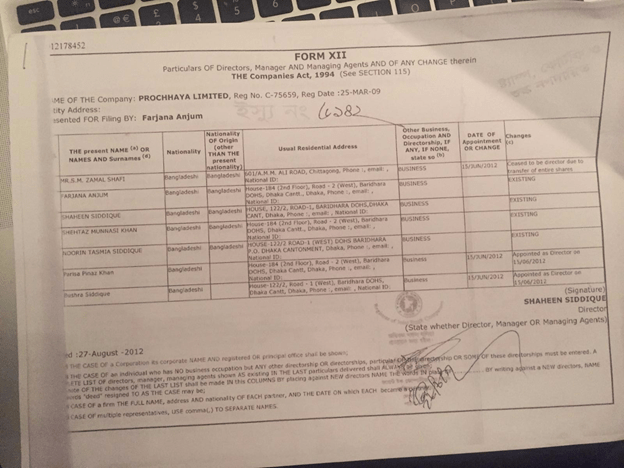 Prochhya’s company registration reveals that not only was General Siddique’s wife a director but so was his brother, Zamal Shafi (until 2012) and his two daughters Noorin Tasmia and Bushra, both of whom live in the UK. Khan was the company’s chief executive officer and his wife and two children were directors. Bangladesh’s national security head is said to have intervened personally in June 2017 when he flew to the UK and met Khan to press him to urgently close the company. Khan duly closed the company but he claims that events then took a more serious turn. His staff gave sworn statements of how in April 2018, a day after Prochhaya was wound up, Siddique’s wife had warned them that she would visit their offices. Shaheen Siddique never arrived, they claim, but a dozen men under the command of two retired army officers entered the offices and took hard drives and financial files relating to Prochhya as well as documents relating to Khan’s other businesses. The men’s testimony describes how the offices were scoured by the group, who broke cabinet locks, carried away 27 boxes of material and removed recordings from the office CCTV system. All four said they were driven to General Siddique’s official government house where the boxes of seized material were unloaded. They say they were then driven to DGFI headquarters where they were held, blindfolded, and interrogated about Khan’s businesses. Two of the men say their lives were threatened. They were all released after 48 hours. Now three of the men who were abducted last April, Johirul Haque Khandaker, Korshed Alam Patwari, and Sayed Akidul Ali, have once again disappeared. Witnesses have told Al Jazeera that in the early evening of January 13, Korshed and Akidul were taken from Akidul’s house by about 20 men, many armed and wearing the black uniform commonly worn by the paramilitary organisation, the Rapid Action Battalion (RAB). Johirul was seen in one of the abductors’ cars parked nearby. Efforts by the families to discover their whereabouts have failed and they fear for their own lives too. Khan believes that his family and staff are the subjects of a campaign of harassment and intimidation. Days after this second abduction, the police raided Khan’s house in Bangladesh claiming that he was a suspect in “anti-state and anti-government activities” and filed a criminal case alleging that Khan, his wife and his three disappeared staff are all involved in “terrorism”. He says all the charges are false. The recent raids, abductions and criminal cases took place just weeks after UK lawyers filed a complaint on behalf of Khan threatening legal action against General Siddique, his wife, and Bangladesh’s intelligence agency. In a statement to Al Jazeera, the DGFI “strongly denied” the claims made by Khan and said it was not involved in the “alleged incidents”. The security agency also claims that Khan has been involved in “controversial activities”, which are “detrimental to military environment and security”, including the “embezzlement of properties”. Khan has denied all of these allegations. General Siddique and his wife have not responded to requests for comment from Al Jazeera’s Investigative Unit. Bangladesh has been criticised by human rights groups for failing to stop the rising number of illegal, secret detentions, many involving opposition figures who never reappear. In a report published in 2017, Human Rights Watch found that at least 90 people were abducted in 2016 by law enforcement agencies in the South Asian nation. The bodies of 21 of the missing were later found. Human rights researchers accuse the DGFI of being one of the state agencies responsible for enforced disappearances. Prime Minister Sheikh Hasina has dismissed calls by human rights groups for action on state abductions and she has remained loyal to General Siddique, who controls the country’s intelligence agencies.